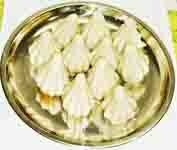 Sabudana chivda recipe - Category - snacks. Snack prepared with nylon sabudana which is specially meant for chivda, which is usually eaten during fasts. Check out other snacks recipes. Sabudana potato vada, sabudana potato thalipeeth, sabudana khichadi, phool makhana snacks, churmuri chiwda, poha chiwda. Boil sufficient water in a large vessel and add the sago to the boiling water. Cook till the sabudana become soft. Drain the water. Spread a thin cloth under Sun. Spread the boiled sabudana over it. Separate each sabudana and keep it under sun till it dries. 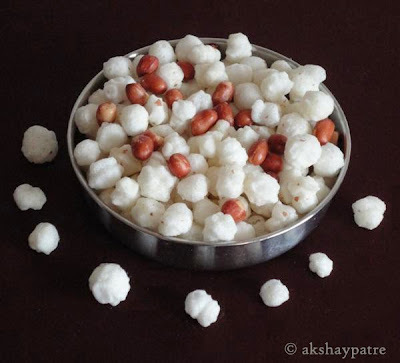 Then store this sabudana in an airtight container. While preparing the chivda, heat sufficient oil in a frying pan. Fry the ground nuts till they turn light brown. Remove and set aside. In the same pan heat the oil and fry the above prepared sabudana till they doubles in size. Drain the oil and spread the fried sabudana on an absorbent paper. Mix the fried ground nuts. Sprinkle the salt and sugar powder. Allow it to cool. Mix gently and store in an airtight container. Feel like having a handful! Very nice! wow..they look plump n beautiful..never saw these ones here,perfect snack!